Glossoloma species are terrestrial (rarely epiphytic) plants, growing in moist and wet forests, mostly at higher elevations. It is distributed From Mexico through Central America and into north-western South America. Based primarily on molecular data, Glossoloma was recently re-established by J.L. Clark for a number of species hitherto referred to Alloplectus Mart. The most conspicuous feature of the genus is the resupination (upside-down-orientation) of the flowers. 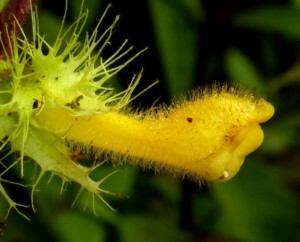 Other characteristic features include terrestrial habit, ± isophyllous leaves, terminally pouched flowers, longitudinal dehiscence of the anthers and fleshy capsules. The genus is related to Alloplectus, Crantzia, Drymonia and Columnea.